Big Blue is a true blue chip in many ways. You'd be hard-pressed to find a more generous cash-sharing policy, for one. The wealth-building power of compound interest will never cease to amaze me. It's a story of patience and attention to detail, where small, short-term differences add up to massive divergence over decades. And in the end, the biggest winners don't always deliver the fattest share-price returns. This time, we'll look at the bluest chip on the market. IBM (NYSE:IBM) has been around for a century, and it sets the pace for the Dow Jones Industrial Average (DJINDICES:^DJI) -- not only by being a rock-solid business but also by having the largest share price among the 30 components. Due to the Dow's price-weighted nature, IBM accounts for more than 10% of the elite index's value. Today, for example, IBM shares gained 0.7% and added 12 points to the Dow; the seventh-largest percentage move on the Dow translated to the third-largest point change. This stock is a market-crushing beast in the long run. It has gained 64% over the last five years (versus the Dow's 19%), 135% in a decade, and 440% in 15 years. And that's before you account for reinvested dividends. You might scoff at IBM's modest 1.9% yield, which sits below the Dow's average. But you can blame that on rising share prices, which are rarely seen as a bad thing. 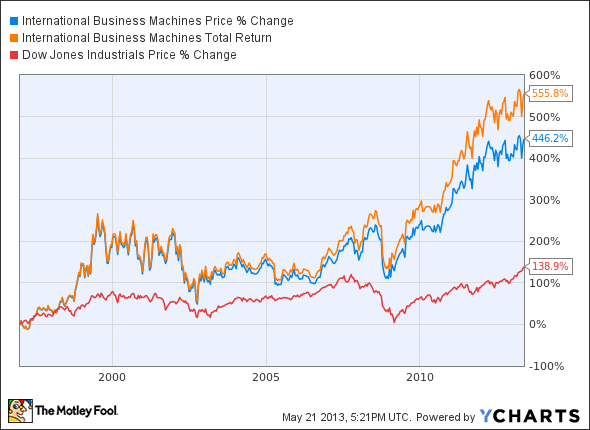 And dividends are not the only vehicle IBM employs to return value to shareholders. IBM Stock Buybacks TTM data by YCharts. 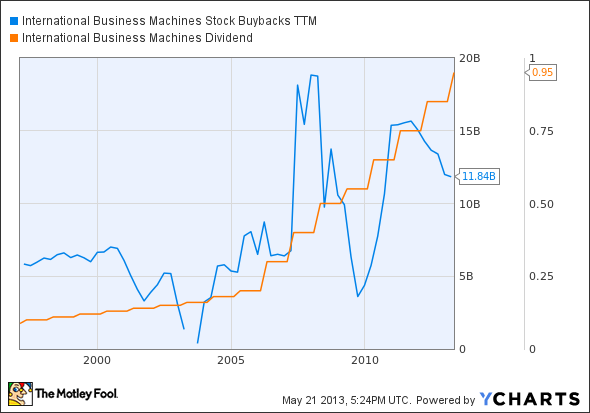 Between 2008 and 2012, IBM spent $15.7 billion on dividend payouts -- generous, to be sure. But the company also spent a net $45.8 billion on share buybacks in that short span (IBM repurchased $60.4 billion in shares while printing $14.6 billion in new shares). That's four times the dividend expense and accounts for nearly 20% of IBM's current market cap. That oft-overlooked policy plays a serious role in IBM's shareholder value proposition.